Spend $75 or more in our Gourmet Shop for FREE Shipping! Valid only for Continental US. This specialty condiment is made by infusing one of the best extra virgin olive oils from the Irpinia Hills with the aroma of the precious white truffle from Alba, Piemont. It has a strong scent of truffle and a delicate taste. 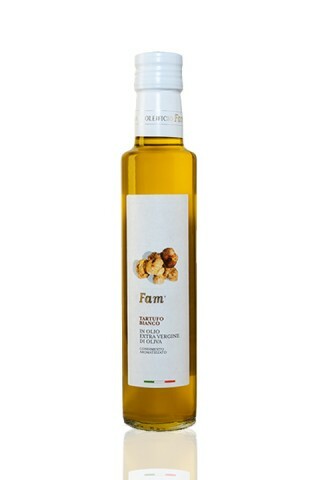 It is an excellent natural condiment for almost anything, but especially pasta, risotto, soup, steak, eggs, and potatoes. Drizzle it over your home fries for a gourmet twist. This oil has a deep golden color with greenish reflections. Buy 3 for $14.35 each and save 11% . Buy 6 for $13.55 each and save 16% . Buy 12 for $12.75 each and save 21% . Flora, Antonio and Maria Tranfaglia, three siblings, created the company F.A.M. based on their desire and pursuit to put into fruition the passionate initiative of their father, Marciano. Marciano’s dream was to make olive oil the pride of the Irpinia area, in the region of Campania, and for it to become a treasured art that would be regarded for centuries to come. F.A.M. is located in the Town of Venticano, a small hillside community in Irpinia, in the province of Avellino, not far from Naples and the Amalfi coast. The company’s dedication to the search for perfection in the art of oil in the few years since its birth in 2000 has gained the appreciation of many lovers of good olive oil. The irrefutable basic idea for the Tranfaglia family is that the quality of the olive oil is primarily determined by the olive trees and then by all the other phases of production. The harvesting is mostly done by hand, and only the olives in perfect condition are picked and are subjected to pressing. The heart of the company is the mill; its 1800 square meters (approximately 20,000 square feet) are divided into large rooms according to the different production phases, the working of the olives, the conservation and the packing of the olive oil, and keeping intact the link between the oil tradition and the use of more modern technology. The company has a tasting room, meeting room and store opened to the public all year round, and visitors are welcomed. The energy and the passion of the young owners has driven the company to achieve the highest recognitions in the industry in just a few years: Three Olives and Label from Slow Food, Two Leaves from Gambero Rosso, Best Bio Olive Mill, First Place for the Intense Fruity category at the SOL of Verona, Gold Medal at the NY International Olive Oil Competition and many others. 2016 © gourmetcookingandliving.com - All Rights Reserved.